This elegant mix of purple and white coloured tulips with a twist. The white petals of Shirley are trimmed with purple, making them an ideal combination. Incredibly versatile, very strong and sturdy. 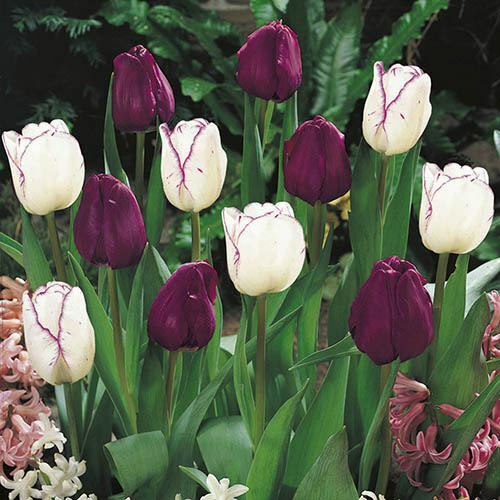 This elegant mix of 'Purple' and 'Shirley' tulips combine a rich, deep plum and snow-white flower with a twist. The white petals of Shirley are trimmed with the same plum shade, making the two varieties the perfect companions. Ideal positioned in a sunny and sheltered spot in pots or planted in large volumes in borders to create an eye-catching capet of spring colour. Incredibly versatile, sturdy and long-lasting, tulips are one of the most popular spring bulbs on the market. They are fantastic for planting in a mix of different colour variations and grow vigorously in beds and borders as well as pots and containers. They also make beautiful cut flowers to brighten up the house - simply cut the long stems, place in a vase-ful of water and place on windowsills of mantelpieces. Supplied as a pack of 20 mixed bulbs, ready for planting.